This famous bit of job advice from the 1967 movie The Graduate was meant to hint at how shallow — how plastic — our culture had become. But this Montgomery Ward catalog from five years later embraces plastics quite without irony, devoting 2 pages to plastic dinnerware, so very hot in the 1950s and 1960s. And you gotta admit, there’s definitely some kind of 1970’s stylistic sensibility going on here. Or maybe a ’60s or ’30s stylistic thing, since Art Deco and Pop Art elements are visible. Actually, I can detect some Art Nouveau and Mid Century Modernism on other pieces. And those inescapeable ’70s colors, goldenrod and avocado (renamed “Granada green” here) are prominent too. OK, so actually the designs are all over the map, but there ARE some nice patterns and pretty bright colors, and everything’s plastic. Or more specifically, Melamine, which was invented in 1936 and didn’t have much longer to go before beating a permanent retreat from our dinner tables. 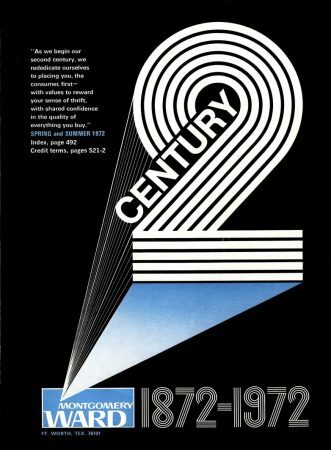 But for one more moment plastic dinnerware was working hard to be hip as part of Montgomery Ward’s “2nd century”, which the catalog cover (also dated) pointed out. 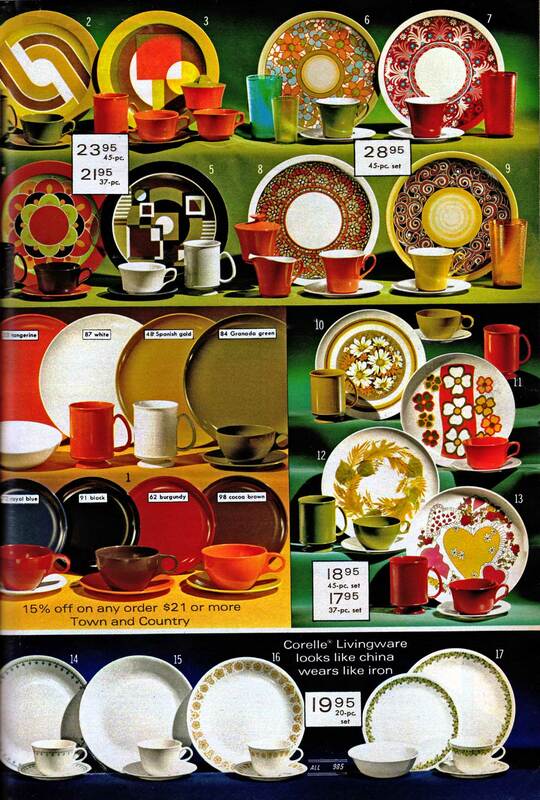 But in fact Melamine’s best years were already behind it when this colorful display was photographed and printed. What took the place of plastic Melamine dinner plates? The answer is pictured at the bottom of the page: Corelle – the quintessential not-quite-china dinnerware of the 1970s and 80s.